This month’s Come Wine With Us was really lovely for a long list of reasons. Chief among those were spending the evening chatting with KWV’s branding manager and one of their wine makers, Charlene and Izele. 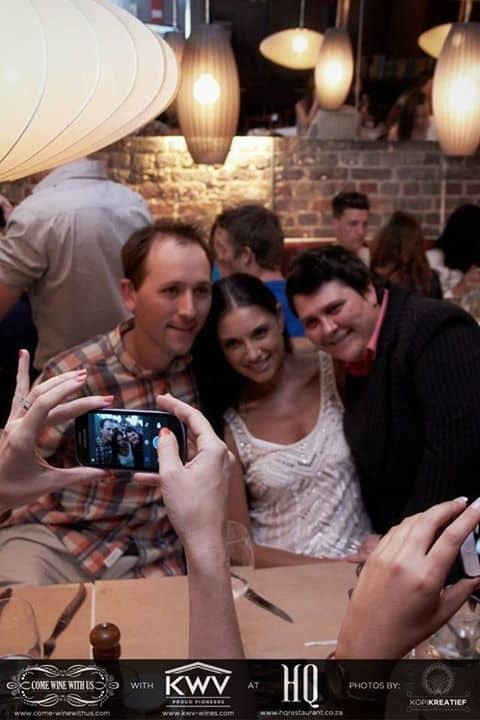 For me, the essence of Come Wine With Us is the opportunity to make new friends, bonding over the shared joy of experiencing new wine estates paired with delicious food. 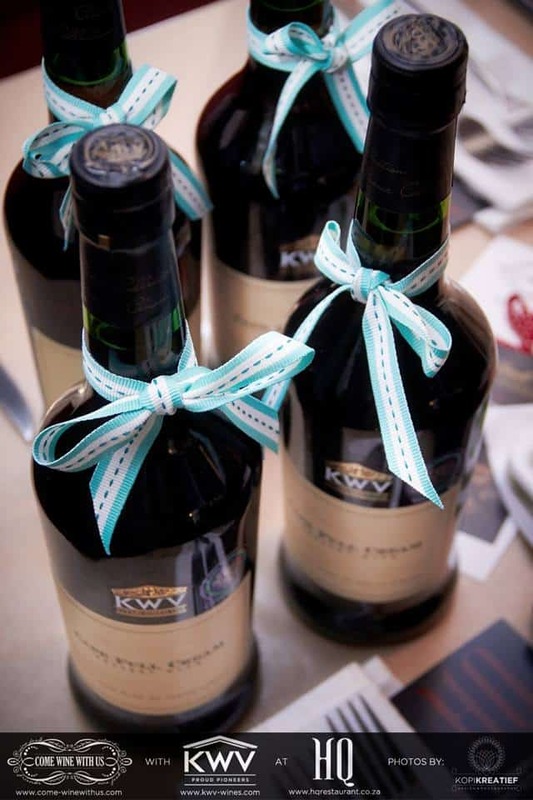 We were hosted at HQ restaurant, wines were from KWV and we enjoyed 2 pairings, first a wine and Lindt pairing, the surprise top pairing for me was the Sauvignon Blanc and Mint Lindt but they were all delicious. This was followed by a 3 course menu from HQ paired with KWV wines from their Classic range. Sauvignon Blanc paired with Lindt Mint Intense, followed by the Pinotage paired with Sea Salt Lindt, lots of plums and cherries and the saltiness from the chocolate working to balance the flavour. The third pairing was the Sparkling Demi Sec paired with white chocolate (I loved that one), and the last pairing was their Fortified Tawny paired with Lindt Chilli. The Sauvignon Blanc and the Tawny are worth a special mention, both deliver excellent value for month (the Sav Balnc at R45 is a double Michelango award winner) and the Tawny at R75 offers a delicious smokiness thanks to 8 – 10 years of barrel aging and just a little 1948 added to give the Tawny it’s depth. 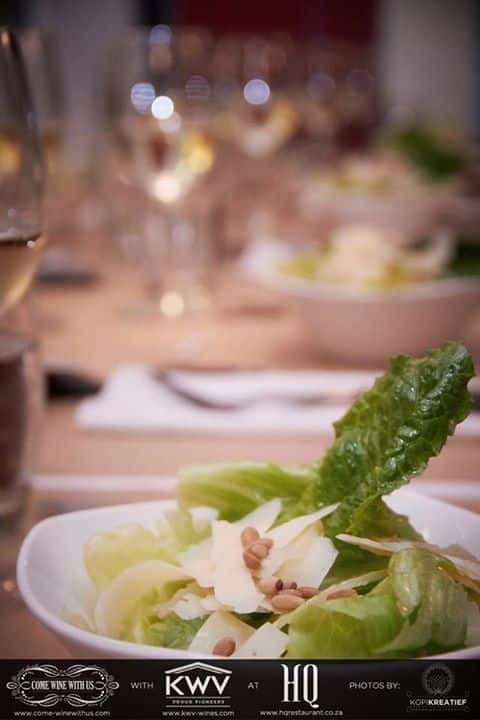 Starters was the HQ salad: Cos and Iceberg lettuce salad topped with toasted pine nuts and parmesan shavings, drizzled with a divine mustand vinagarette dressing. This was paired with the KWV Classic Chenin Blanc. I enjoyed the Chenin, it’s easy drinking and retails for R35 a bottle which is really good value. The salad was simple and enjoyable, my only slight negative was that the cheese was sweating a little (most likely due to being out the fridge for too long). This is only a minor thing though, when you consider that they served 60 of us in one seating all at the same time. 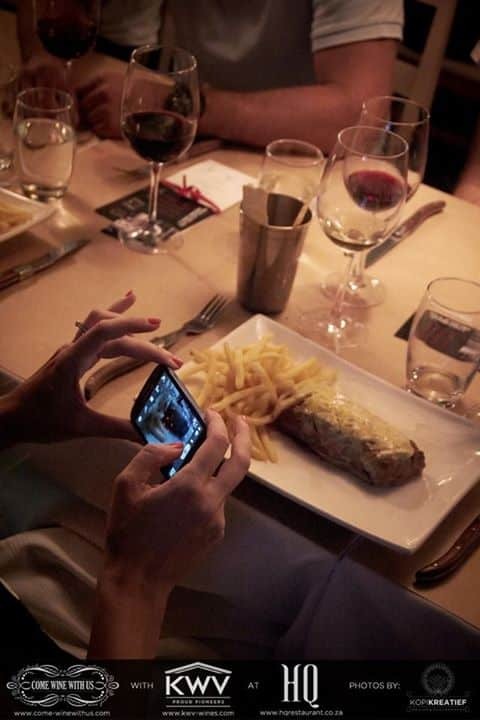 Mains was the signature HQ free-range sirloin, lightly covered with Cafe de Paris butter sauce, served with skinny frieds. 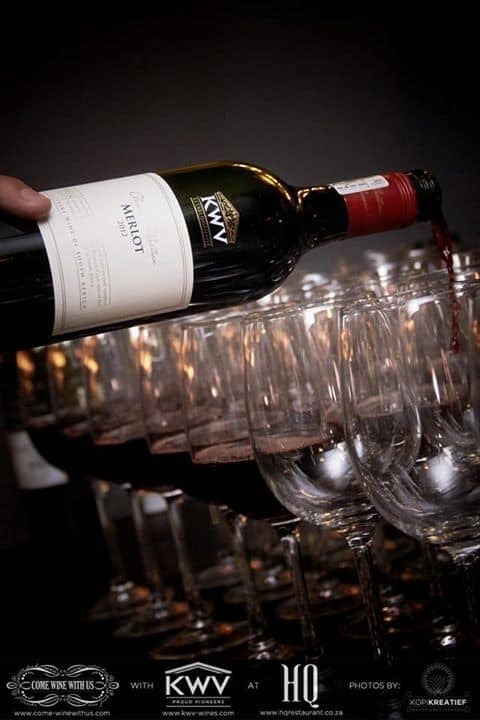 The steak was paired with the KWV Classic Merlot 2012 which is INCREDIBLY more-ish – it just seems to disappear from your glass – I’m still not sure where it all went! The steak was perfectly cooked, medium rare, it was tender and the butter sauce offered a good balancing flavour. 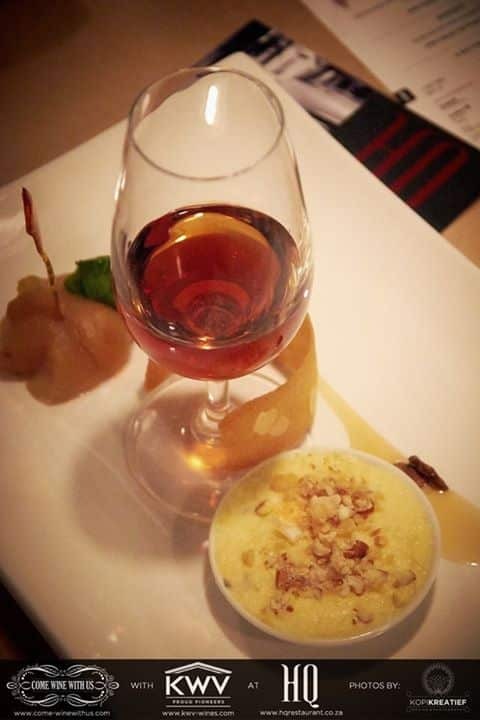 Dessert was a deconstructed Gorgonzola and white chocolate creme brulee, very tasty and exquisitly complemented by the KWV Classic Full Cream Sherry NV. Come Wine With Us in May! The next Come Wine With Us is going to be exciting, have a look at the invitation below and make sure you book now! Thank you to CWWU, HQ and KWV for hosting us. Views are my own and images have been provided by CWWU.